Will we see The Undisputed Era making up their much-awaited debut on main roster next week? The Survivor Series PPV in itself was a surprise to the WWE Universe as Raw thrived at the PPV without a single defeat. Also, in the main event of the PPV, we saw Daniel Bryan taking on Brock Lesnar. As witnessed, the YES man was so close to beating The Beast Incarnate but unfortunately, no one can survive against The Beast. As now the Survivor Series has passed, let's talk about what surprises could we see next week on the episodes of Raw and SmackDown Live. So, here in the list. Let's try to figure out what things WWE might do next week on WWE TV to surprise us as WWE will now start building towards their next PPV - TLC. Let me know in the end which of these scenarios are likely to surprise you. 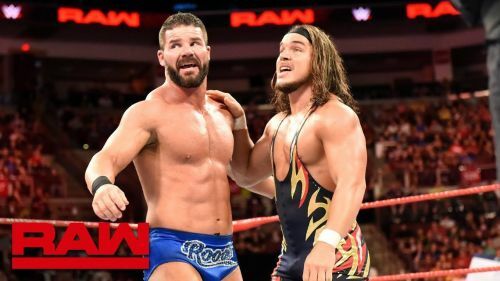 The alliance of Bobby Roode and Chad Gable certainly came out of the blue. Nobody could have imagined these two men to unite as a team. And if you are enjoying seeing these two men unite as a team, then don't get your hopes too high because every team is meant to be broken and the team of Roode and Gable is certainly one of them. Also according to rumors, these two men were brought together as a team so Roode could turn heel which will eventually escalate his career as his Glorious gimmick has always suited his character as a villain, not as a good guy. So, hopefully, next week, expect this strange alliance of Roode and Gable to break-up. And I guess WWE Universe is looking forward for Roode's heel turn more than seeing Gable as a face.